Jordan's King Abdullah has urged the world to act to end what he described as the continuing suffering of Palestinians under Israeli occupation. 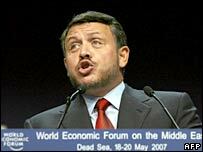 "There can be no more delay," he told some 1,000 politicians and businessmen at the World Economic Forum in Jordan. "This suffocating situation has brought poverty, malnutrition, frustration and radicalisation," King Abdullah said. He urged the gathering to prepare investment plans for the "day after peace" in the Middle East. Addressing the three-day forum in Shuneh on the shores of the Dead Sea, King Abdullah said the absence of peace and continuing Israeli occupation were having a devastating effect on the Palestinians. The monarch said that three of every five Palestinians were jobless, and that hundreds of thousands were living in poverty. King Abdullah avoided any direct reference to renewed fighting between Palestinians in the Gaza Strip, which had prevented Palestinian leader Mahmoud Abbas from attending the forum. However, Saeb Erekat - Mr Abbas' aide, who is attending the forum - described the current situation in Gaza as "the darkest chapter in Palestinian history". "It's partly due to the absence of the rule of law, the one authority, the one gun," Mr Erekat said. King Abdullah also called on the participants to be ready for a time when peace in the conflict-torn region became reality. "As we look to that day, we need to begin asking a new question: what about the day after peace? "Will we be ready? Will we have the plans in place to realise the benefits of peace and build on them? Will we have the vision to see our region's potential and act on it?" the monarch asked. The Geneva-based World Economic Forum is an independent international body that seeks to improve the state of the world by engaging leaders to shape global, regional and industry agendas. It holds its meeting every year.